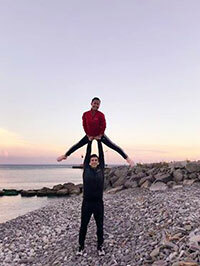 The Skate Canada “Autumn Classic International” marks our entry at the international competition, in the senior category. Our objectives for this competition were therefore not relative to the ranking, but rather to the performance that we can deliver in competition, compared to the one obtained during our training. This year being a post-Olympic year, there are many regulations that have changed compared to last year. Moving from the junior to the senior category also involves adjusting to new technical criteria, such as, the emergence of a new scope in the free program. 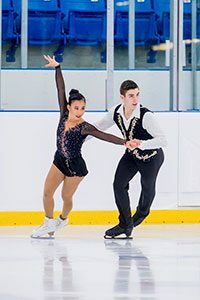 We did not do our best programs at this competition, but the most important thing for us was to learn from this great experience among the “biggest.” Indeed, we had the chance to compare ourselves to two couples who went to the Olympic Winter Games in Pyeongchang last February. This experience proved to be very exciting for us since we could see these teams practice under our eyes. In addition, the atmosphere is not the same in the senior! Even during our practices, the stands were fuller than at the “Junior World Championship” we attended in March! It is impressive! I must say again, that here it is a different stress and an adaptation to the elements on which to focus! Lori-Ann and I leave with something even more precious than our fifth place: experience and a starting point on which we will continue to build in future years …!